The volcanic cone Arai Ler looms over the countryside, in clear view of Mt. Aragats and the Andes Range. 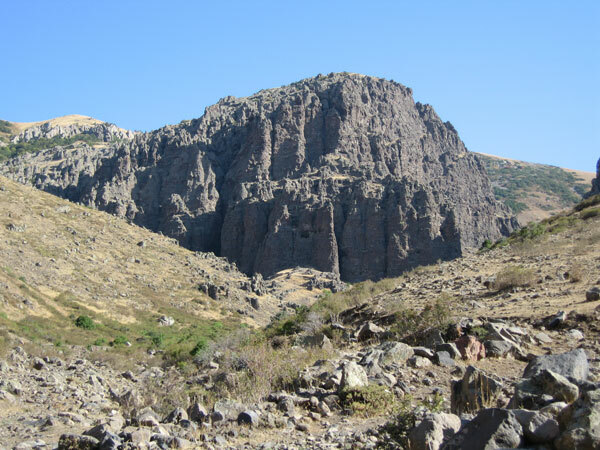 The mountain, named after the mythical Armenian hero Ara Geghetsik (Ara the Beautiful or Handsome) slain by the Queen Semiramis (Shamiram in Armenian) is so named because of the shape of its crest from the west. The mountain ridge resembles the prone face of a man, some saying it is the body of Ara, banished to the mountain by the dark arts of the Babylonian queen. The sunken cone is open on several sides, allowing melted snows to form the mountain streams that feed the Kasakh and Hrazdan Rivers. On its northern side the mountain has traces of the native forests that once covered its slopes, the northern shadows protecting the trees from the hot southern sun, which is brutal in the summer. 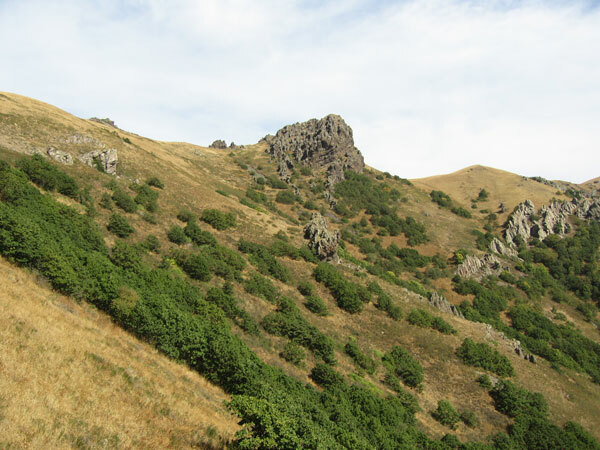 The mountain is a unique combination of geological strata, with andesite-basalt rock formations on its Eastern slope and fields of «stone hail», rounded volcanic stones formed from sprays of lava that hardened while falling to the ground or formed while rolling down the hardened slopes. Other slopes (south, east) have tall rock monoliths with natural caves and rich, fertile volcanic loam that nurtures an incredible variety of flora, a number of species of which are unique to Arai Ler. The northern slopes are forested; though illegal logging is slowly stripping the mountain of this vital resource that prevents land erosion and desertification. The forests consist of hardwood species (oak, maple) with birch and seven species of ash along with others. The forests consist of hardwood species (oak, maple) with birch and seven species of ash along with others. In addition the forests have a number of wild fruit trees and berries. About 50 species of shrubbery grow on the slopes. Western slopes show the effects of clear-cut logging, emerald green during a few weeks of spring, the slopes quickly dry in May, turning a harsh shade of brown for most of the year.